For when temperatures are soaring . . . and it seems too hot to even eat fruit . . . eat it as a granita! Temperatures are always high here in KL, but I typically don’t mind. Being pregnant changes a lot, including your body temperature. I have been making these “granitas” since January– and treats like this kept me sane (and my belly full) when I was too nauseous to want to eat much else besides frozen fruit! Thank goodness those days are over — now the biggest discomfort is just feeling hot all the time! I saved this recipe for when watermelon would be available for more of you. It’s grown locally here, and local produce is available year round. No “growing season” in the tropics! After buying my Vitamix, I got on a big kick of throwing whole citrus in it for (virgin) margaritas and Orange Julius-type drinks. A craving for all things sour had me soon throwing in whole grapefruit. I’ve used grapefruit before in smoothies, and love the bright sour flavor it adds. A high speed blender will totally break down even the tougher pith of grapefruit. I have not tried this recipe in a normal blender, but assume it would leave too many chunks of pith in the mixture. If you want to try this sans-high speed blender, I would recommend freezing the grapefruit first, and then upping the liquid. I found last year that if I cut my grapefruit into small pieces, and froze it, it blended up nicely into smoothies. 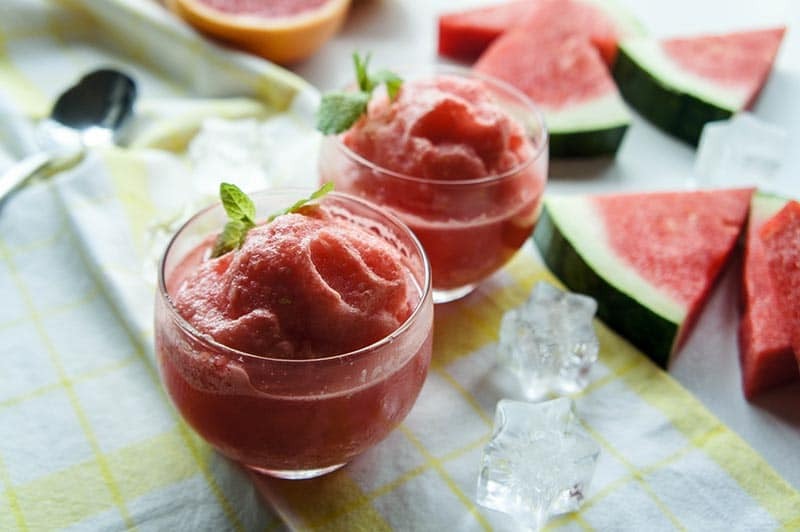 This granita-like treat is made quickly in a blender using a whole grapefruit and frozen watermelon. A refreshing, hydrating treat for when temperatures are soaring! Add the peeled grapefruit (I cut the peel off quickly with a knife), frozen watermelon, ice, and orange juice to a high speed blender. Blend on mid-high for 1-2 minutes, using the tamper stick to keep the mixture blending. Blend for 30 seconds up to a minute after you think it's finished to make sure the grapefruit pith has been completely broken down and the mixture is smooth. Serve as two small granitas, or as 1 large slurpee-like smoothie! *If your grapefruit is very sweet, plain water or coconut water would work fine in this recipe. The grapefruit I buy in Malaysia is always very sour, so I find adding a bit of orange juice sweetens this treat up perfectly. **If you prefer a sweeter treat, add honey or sugar, a teaspoon at a time, until it's right for you. O yum! Sure is the best way to cool off! Sweet and tangy! So refreshing! Will be sipping this on our deck for sure!! This is exactly the kind of thing I love making for my little ones at the moment. I would just add a dash of honey because I hae a sweet tooth! Beautiful food styling, lovely! Thanks Mel-- yes-- hopefully your grapefruit is a bit sweeter than mine and you wouldn't need much honey! But luckily I have been really into sour lately. Granita is perfect for the hot days of summer, here in Minnesota. I love the red grapefruit in this recipe. Looks so yummy! 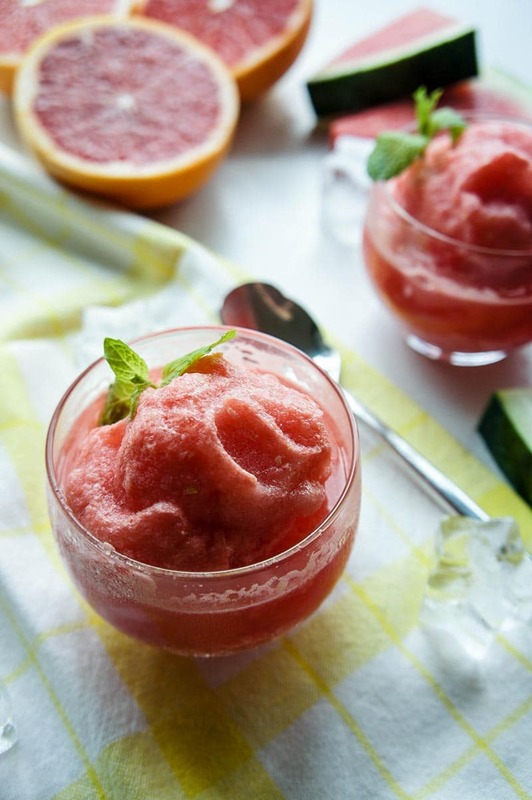 Grapefruit is such a wonderful flavor, and perfect for this frozen treat-- if you like sour, you'll love it! Michelle this sounds so refreshing freezing your watermelon is a great idea and adding a bit of grapefruit gives it some really delicious zest. Busy sharing, pinning! Gorgeous photos! This looks sooooo delicious! 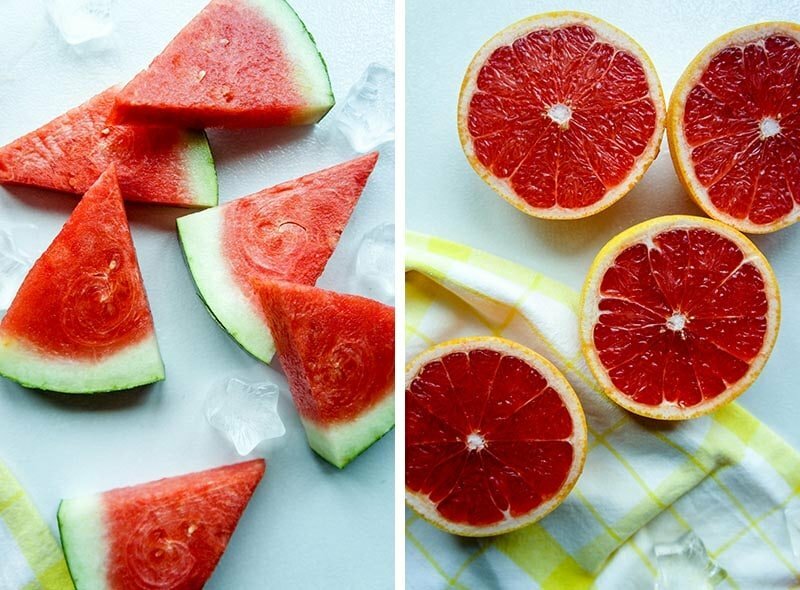 I love both grapefruit and watermelon!! Yum! these look so cool n yummy!! It makes a great dessert-- or breakfast, for that matter! Its the perfect treat when its hot. Oh, this sounds so refreshing!! Yum! Very refreshing-- perfect for the high temps everywhere right now! Yes-- I think so! 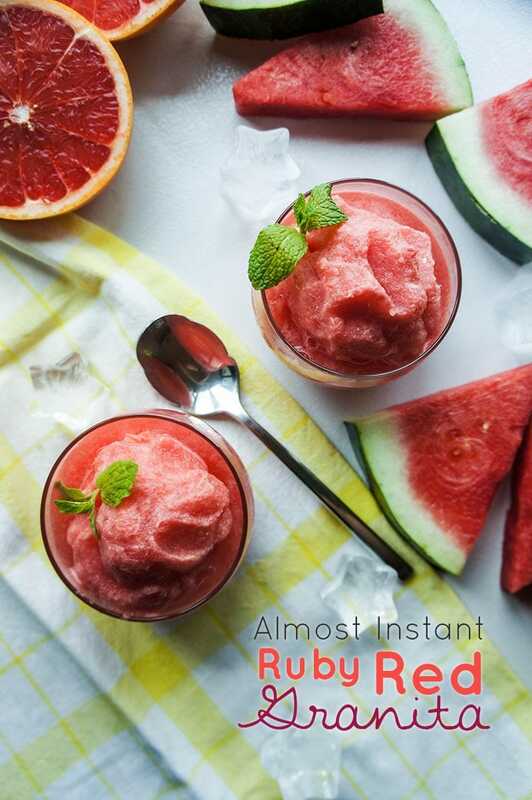 I created this recipe early in my pregnancy when I couldn't stand anything sweet -- the sour cold was exactly what I wanted, and it's been super refreshing in the heat lately as well! Hi Saumya, it is very refreshing! Thanks for stopping by. I'd never have thought of putting watermelon with citrus fruits but I bet this is amazing. The watermelon actually just adds a bit of sweetness, and the main flavor is the grapefruit. It does make a pretty good combo! This looks like such a refreshing dessert and healthy too! I can't wait to try this slushie combo. Do you think a food processor would work for this. Not sure my blender is "high speed" enough. I will take your suggestion of the Grapefruit juice. I love granitas!! They so refreshing, easy to make and versatile... I need to try your flavor combination soon. Pinning. Thanks for pinning, Oriana. Yes, it's easy and refreshing-- exactly what I've been needing lately! Grapefruit doesn't get nearly enough of the love it deserves! I love that you highlighted it here! Totally agree. I LOVE grapefruit-- its certainly a craving I have often! What a refreshing looking treat for a hot day! I could totally serve it to everyone as dessert and tell them that it's water ice and they would believe me! I love the idea of enjoying it as a cocktail, for those really hot summer nights. I'm pregnant right now, but I think I'll give that a try in a couple of months!